I've never had much of an interest in team sports. I attended a few minor league baseball games as a kid - my dad was briefly a huge fan of the Everett Aqua Sox - but that's about it. I've watched the Super Bowl a few times, always at a family member's house. Most years I hardly even know what teams are playing. However, over the past two years, Andy and I have developed an enthusiasm for the Super Bowl. Not because we're excited about watching it, but because we've learned that with everyone else at home watching the game, we can sneak away and enjoy typically crowded places in much more peaceful conditions. 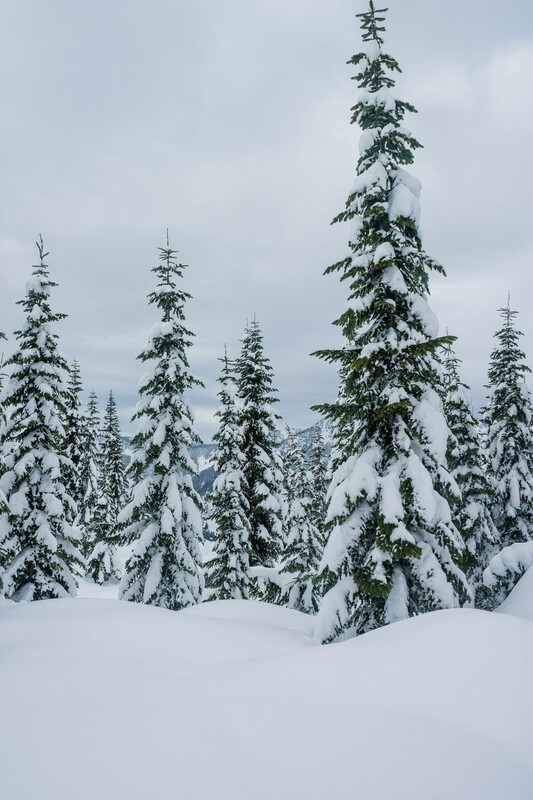 This year, since there was still plenty of snow in the Cascades, we headed out for some snowshoeing, hoping that this time we might actually need our snowshoes. We took our time in the morning, and didn't make it to the Hyak exit until after 10. Much to our surprise and disappointment, the parking was already quite crowded. Our plan for avoiding weekend crowds had failed! After parking and making the trek from car to trailhead, we strapped on our snowshoes and started the gradual but constant climb. We quickly passed many families with young kids out for sledding expeditions. Soon we gave up on our snowshoes - on the well packed, wide road, they were once again unneeded, and we made much better time without them. As we started, I felt a little disappointed in the lack of fresh snow. Planning the trip, I'd had visions of trees doubled over from the weight of snow. After about the first mile, I was too distracted by the lovely views to be disappointed any longer. From above, we could watch the wispy clouds slip between the surrounding peaks. We were also amused to watch the lines at the ski resort below. 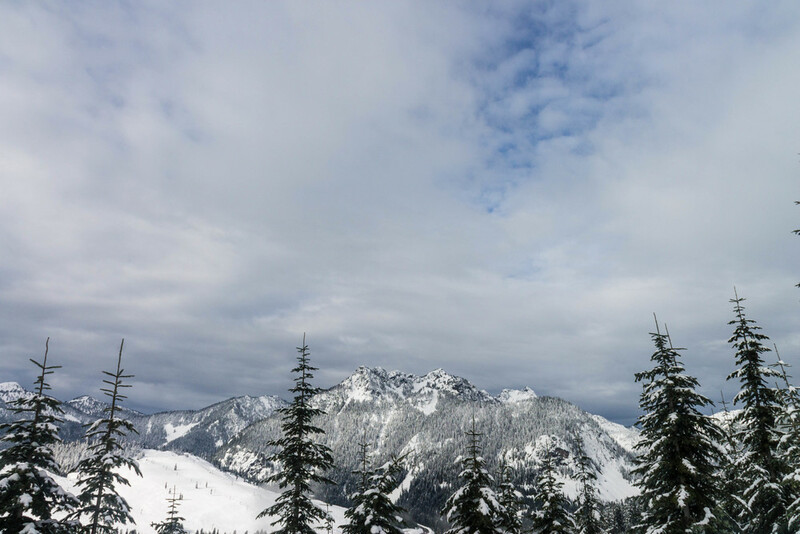 Andy noticed that of all the hills at The Summit at Snoqualmie, the sledding hill was bay far the busiest! With much less effort that I'd expected, we were soon at the lower lake, where we found the perfect spot to set up our insulated picnic blanket and enjoy our lunch, including some wonderful Mexican hot chocolate to keep us warm. I was impressed that we made it all the way to the lakes. While the hike wasn't too difficult, 9 miles on snow is very different from 9 miles on dirt! One difference we both noticed was that since there's never anywhere good to sit on a snow covered trail, we spent much less time taking breaks. The cold temperatures were a nice change from hiking in the heat of summer, but I was surprised how little I needed the breaks. That said, obviously we still made many short pauses along the way for photos of the views. On the way back out, we noticed that even with all the clouds, we could see Mt Rainier peeking out from behind the much closer peaks of the Cascades. The snow at the top of the ridge was deep and soft, so we wore our snowshoes, mostly to make it easier to pass other hikers without postholing past our knees! Once we were back on the more heavily used, packed section of the trail, we took our snowshoes off and hurried back to the car. By the time we were back at the trailhead, the Super Bowl had started, and the parking area was almost deserted. At least we didn't have to deal with the spectacular traffic jams I've read about in recent trail reports on this hike. I think snowshoeing on Super Bowl Sunday will have to become a new tradition!